Victoria “Tori” Murry, senior public relations major, was crowned Miss Georgia Southern University at the 69th annual pageant hosted by the University Programming Board (UPB) on Saturday, Jan. 21. Murry took home the title of Miss Georgia Southern after her performance of “She Used to be Mine,” from the musical The Waitress for which she was also named Best Talent. She also earned the title of Best Evening Wear. 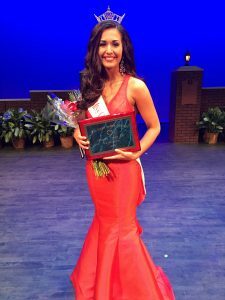 The Alpha Delta Pi representative and Fayetteville, Georgia native will now go on to represent the University at the Miss Georgia Pageant in June. Murry received a $2,000 scholarship which includes a travel stipend, 25 percent off all purchases at Frills by Scott, a Miss Georgia photoshoot and headshot courtesy of Lori Grice Photography and a host of other gift certificates from local vendors. “I am thrilled to be Miss Georgia Southern because now I have the opportunity to share my love for this University with the rest of the state and hopefully the entire country on the Miss America stage,” said Murry. Anna Freeman of Statesboro was named first runner up as well as Best Lifestyle and Fitness and Miss Photogenic, a title chosen based on the number of “likes” her photo received on the UPB Facebook and Instagram accounts prior to the event. Jacksonville, Florida native Shannon Atkins was named second runner up. Allyn Jones of Albany, Georgia was both the People’s Choice and Miss Congeniality. The judging panel was composed of a combination of both University faculty/staff and certified Miss America Organization (MAO) judges. This year’s panel consisted of Courtney Herndon, DNP, current co-director of the Miss Golden Isles Scholarship Pageant, Tim Harris, MAO-certified judge, Bryan Realiza, University alumnus and dancer for Dancing with the Statesboro Stars, Angela Harn, senior director in University Advancement and Kendria Lee, Double Eagle alumna and Operations Manager in the Office of the Vice President for External Affairs. “This group was truly a pleasure to work with and has been cooperative and genuinely kind to one another throughout the entire process,” said Memory Littles, assistant director of the Office of Student Activities.